Retro Football Shirts | Vintage Classic Kits, Old Fashioned Historical Soccer Jerseys. TOFFS is The Old Fashioned Football Shirt Company. They manufacture retro football shirts from the UK and all over the world in Gateshead, Newcastle-upon-Tyne, England. I’ve not seen their shirts, except perhaps on Gavin and Stacey, but they look good. Whether all their football shirts and accessories are made in the UK I am not sure, so please check before buying. It says on their twitter page “We manufacture retro football shirts from over 100 years of history, here in the UK” which implies that at least their football shirts are made in the UK. Great stuff 🙂 but take note about the England and Liverpool shirts. 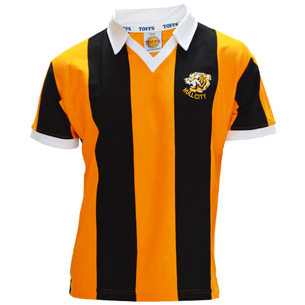 TOFFS Hull City 1975-1980 Retro Football Shirt. Made in England. This entry was posted in Clothing, Menswear, Sports and tagged TOFFS, TOFFS Football Shirts on June 30, 2013 by ukmade.